This little story was the winner of the RedBeard Bakery 50 Words Microfiction Competition, at the Words in Winter Festival, Trentham, Victoria. It is up by link on the Word in Winter site, but I thought I’d post in here now. Prize winning entries in the other categories can be read here. The story had to be exactly 50 words long; hence the rather clipped tone! The theme was ‘Origins’. It was hidden in the op shop, behind fifteen copies of Fifty Shades. First edition Darwin. Original Origin. He grabbed it from me, paid $5, and ran. I followed, did only what was necessary, and reclaimed the book. That’s only fitting, if you think about it. I also have a micro-poem just published in Award Winning Australian Poetry (Melbourne Books) which is being launched in Melbourne on the 30th August, at the Athenaeum Library in Collins Street, at 6pm. I went last year and it was a great launch. So, after two micro awards, I’m obviously getting big in a small way. I received $200 in vouchers from a great bakery in Trentham for the story, which probably works out at a large roll a word, and will have to drive down and stuff myself some glorious and calorific day. And on another note, over at Overland there’s an extended debate about whether ‘bush poetry’ deserves to be included in ‘Best of’ collections. I find it fascinating how this sort of debate tends to attract so many more men more than women; what is it about definitions and certainties? But, anyway, here’s my less than serious contribution. than trying to know poetry by explaining. Next week: post-structuralism summarised in a limerick, and semiotics in a haiku. And on yet another, far less frivolous note, send a thought to the home of real haiku, who just had a missile sent over their northern island. 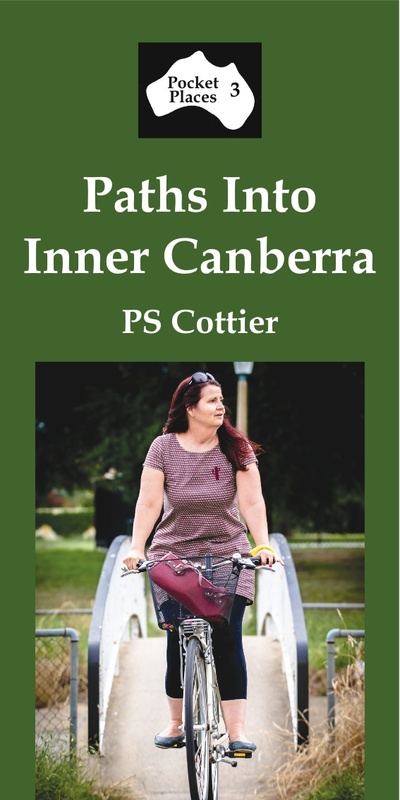 The book can be purchased from me (for those who ride bikes/drink too much coffee at cafes), from Book Lore, Lyneham, in Canberra, or from the publisher, Ginninderra Press. It is $4 (plus postage, if you order online). It is a prose essay with two poems. It snowed yesterday in Canberra, so I was not on my bike. Snow is an occasional surprise here, and everyone was armed with their smartphones to record the phenomenon of cold dandruff. It has never settled on the collar of the pavement, though, that I can remember.